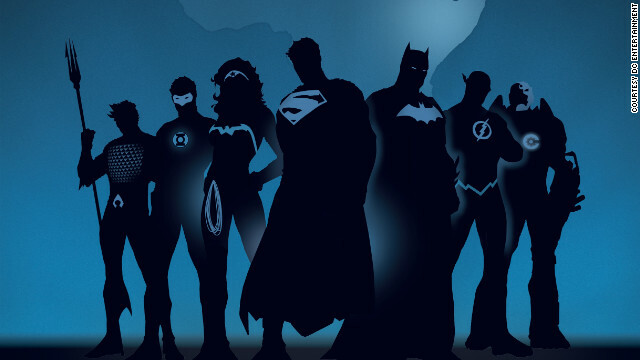 Part of the We Can Be Heroes logo featuring the silhouette of the Justice League. Will nerds feed starving kids in Africa? She may not be a nerd, but she runs a company whose media inspires nerdy devotion. And starting this week, DC Entertainment is hoping their characters from "The Justice League" will be a vehicle to educate fans about the very real famine in the Horn of Africa, and inspire them to donate money to the cause. The We Can Be Heroes website also offers specially branded merchandise for sale, featuring the silhouette of the Justice League against the outline of Africa. Fifty percent of the proceeds of this merchandise will also be donated. "Actually, one of my favorite things about this completely insane geek community is seeing what happens when we try to band together to help," said Daniel Dean, a manager for Titan Comics & Games in Smyrna, Georgia, and a frequent Geek Out collaborator. "See, to me this isn't about 'I like the Justice League, therefore I will help a 6-year-old girl not starve to death.' It's a case of believing in everything people like Superman and the Justice League are supposed to represent," Dean said, "and standing ready and waiting to help so that when an opportunity like this comes along we can jump at the chance." He likens the initiative to Paul Dini and Alex Ross' comic book "Superman: Peace on Earth," which has Superman spend one day trying to make sure no one in the world goes hungry for one day, instead of fighting super-villains and crime. "He is ultimately unsuccessful," Dean said, "but his message in the book – that we can all come together to help and educate one another so that we can in effect save ourselves and accomplish what Superman could not – is absolutely something to strive for." But the special merchandise offered at the We Can Be Heroes website is something of a letdown for fans of Superman and the other superheroes in Justice League, he said. The silhouette design is not something that directly speaks to a Superman fan's motivation. The dollar-matching is a far bigger incentive, he said. The initiative is already drawing comparisons to DC's "Heroes Against Hunger" comic from 1986. It's storyline focused on famine in Ethiopia, a Horn of Africa nation. Nelson said it was actually part of the pitch that convinced Time Warner to join the "We Can Be Heroes" initiative. "It was a single book and not necessarily the greatest narrative we've ever had come out of DC, but there is a relevance to the legacy of addressing famine," Nelson said. "It was that that caused one of the gentlemen who runs one of the aid organizations that we announced as one of our partners to approach our management." "This is a perfect example where we can make a difference with these characters. There isn't as much awareness of how bad the crisis is and how fixable it is with the right attention and action by individuals," she said. "What I hope to see from We Can Be Heroes," Dean said, "is something more reminiscent of Marvel and DC's charity efforts in the wake of September 11, 2001, or the comics and RPG retail community's fundraising efforts in the wake of the devastating Japanese tsunami," Dean said. The comic book industry made a strong and unified response to the 9/11 terrorist attacks, as did the comic book-reading community. In January and February, 2002, DC published "9-11" Volumes 1 and 2 - two comic books that combine short stories and illustrations from some of the best writers and artists from DC, Image Comics, Dark Horse Comics and Chaos! Comics as well as independent creators. The proceeds of the books went to the families of 9/11 victims. In December 2001, Marvel Comics published the poster book "Heroes: The World’s Greatest Superhero Creators Honor the World’s Greatest Heroes," the proceeds of which went to the Twin Tower Fund. That same month they dedicated an issue of "The Amazing Spider-Man" which featured a black cover and is known as "The Black Issue" to Marvel universe superheroes reacting with shock and sadness to the real-world event of the terrorist attacks. In February of 2008 they published another tribute, the "Moment of Silence" miniseries. "They were inspirational efforts and for the most part great comics that let fans marry their extant contributions in the wake of the disaster with their favorite form of much-needed escapism," Dean said. And that seems to be the most public way nerds and fan bases deal with disasters. In response to the Japanese tsunami disaster, cosplayers and comic book artists put together a fundraiser calendar to aid relief efforts because the anime and video games that inspire them come from Japan. But even nerds obsessed with their pets organize online communities and charity programs for their common inspiration. The question is, how will nerds react to learning about the hunger crisis in the Horn of Africa? Data on global food aid deliveries in metric tons are from the database of the International Food Aid Information System (INTERFAIS), which was developed by WFP as a contribution to a coordinated international response to food aid shortages. INTERFAIS is a dynamic system, which involves the interaction of all users, represented by donor governments, international organizations, non-governmental organizations, recipient countries and WFP field offices. They are sharing information and data on food aid transactions.;.. Posted on Eisner awarding nniniwg comic-shop, Zeus Comics is in Dallas which may or may not be on your route.Though I think you've hit upon a fantastic idea something we maybe should talk about off-site.If I don't talk to you before hand, have a safe trip! What the heck! They put the Cyborg in the justice league photo but they failed to put the Green Arrow in the silhouette wth! Just don't let them eat too many Paula Deen dishes or then they will have high blood pressure and diabetes to worry about. There have been starving people in Africa my entire adult life, and I am 45. The causes of hunger on that continent are too complex to get solved by giving them food. Food aid only makes their problems worse. Didnt some comedian say that all those people who live in places without food should move? someone January 23, 2009 Did you base nbumer 8 entirely on that Yahoo! Answers thing? Because Yahoo! Answers is clogged with the stupidest people capable of using the internet.Some memorable questions include How do I scan a mirror and use it as my background , Where can I find scuba-diving equipment for my horse and I heard on TV that there's a war in Georgia, when do we evacuate (The person lived in the state Georgia of the US, the war was in the country Georgia halfway across the world.) It's also likely that a lot of the people there are being asses on purpose.Yeah, this post's main purpose was just to rant on Yahoo! Answers ) But I think our reputation is more on being ignorant and too prideful. Not to mention kurakot. Could you also report on Anderson Cooper sriattng a show on FOX?Is CNN and FOX subsuming into some sort of pseudo-news media conglomerate sometime soon? how bout sending some birth control over with that food? Not sure about the US but here in Canada the government has actually stopped providing planned parenthood to Africa – very disappointing! What makes you think that famine is related to birthrates? Additionally, this article fails to point out that the famine being referenced is not general to Africa as a whole but localized in Somalia. Its due more to conflict and a changing climate. Did they mean to name it after a David Bowie song? My partner and I auoslbtely love your blog and find nearly all of your post's to be exactly I'm looking for. Would you offer guest writers to write content in your case? I wouldn't mind producing a post or elaborating on most of the subjects you write with regards to here. Again, awesome website! I thought they were talking about the candy. I was gonna say that sounds like a bad idea. What would life be like in the US for many if these companies used that money to help the families here who don't have enought to eat, are homeless, etc. I guarantee that most homeless people in the US is much better off than homeless people in africa. In the US, people throw away a lot of food that ends up in the belly's of homeless people. In Africa, it's most people that are starving, no just the fringes. I think they will do more for world hunger than "god" has ever done. God has given us free will and the ability to make decisions. We can decide to live comfortably in our own world and turn a blind eye to other's problems or we can recogize that we are God's hands and do something about it. God will not 'step in' and feed the hungry anymore than he will 'step in' and help me put my pants on in the morning. God stepping in would only feed our selfishness. We are our brother's keeper. Spread the Love. since you are your brothers' keeper, i expect you will make a hefty donation to this cause. if not, God will look down on you and shake his head since you speak his word, but won't act on it. I wish to express some thnkas to this writer just for bailing me out of this particular issue. Right after researching throughout the internet and getting tricks that were not pleasant, I assumed my life was done. Living without the approaches to the problems you have resolved by way of this guide is a critical case, as well as the kind that could have negatively damaged my career if I hadn’t encountered the website. Your good expertise and kindness in controlling every part was valuable. I am not sure what I would have done if I had not discovered such a step like this. I am able to now look forward to my future. Thanks for your time very much for your impressive and amazing help. I will not hesitate to suggest your site to any person who needs and wants guide about this problem. Beautifully said. It shows the compassion and the spirit all of these superheroes are supposed to represent.